LIFTING IT RIGHT: Vehicle weight and determining the right two-post car lift for you. At Eagle Equipment, we feel that one of the most important parts of our job is helping customers make the most informed purchase they can. We often find ourselves as educators; correcting many assumptions in the industry. People often try this with their full-size pickup trucks; then wonder why we suggest something more stout. The first thing you need to know is what you’re lifting. Look at the sticker on the door jam for the weight and distribution. Then, take a glance to see what’s inside and where the weight is. Some trucks have toolboxes or other things that add a significant amount of weight to the vehicle. Continue reading LIFTING IT RIGHT: Vehicle weight and determining the right two-post car lift for you. Posted on June 4, 2018 January 11, 2019 Categories Eagle Equipment, Eagle LiftTags 2 Post Lift, Auto Lift, Automotive Lift, Car Lift, lifting capacityLeave a comment on LIFTING IT RIGHT: Vehicle weight and determining the right two-post car lift for you. Do instructions ever seem like another language? Sometimes they are! When I got home and begun to put it together I realized the importance of good instructions for customers who have to set it up, in a language they can understand. To say I was a bit frustrated would be an understatement. The picture-only instructions with warnings written in Swedish were not comprehensible to me. How am I supposed to understand that? So, I did what I think anyone would have done…. I did my best and just hope it doesn’t topple over. Fingers crossed. I began to look back on the manuals that Eagle Equipment provides our customers and feel like we do an exceptional job of helping you get your equipment up and running, or troubleshooting a problem, if ever one arises. We don’t just leave with you with some fun pictures to look at, but really useful stuff! Everyday, Eagle Equipment Customer Service gets calls from customers who fail to even acknowledge the instructions. 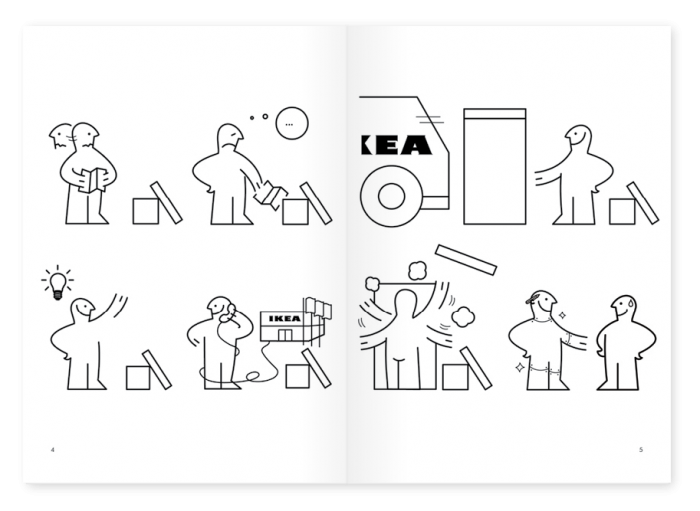 (Perhaps they assume they are similar to the IKEA ones and will be of no help, or perhaps they assume they know what they’re doing … until they don’t.) Either way, here are some examples of recent calls that would have been spared if the manuals were glanced at first. Failure to read the instructions can ruin your brand new machine. As we are informed every day, there are professionals out there who have been installing lifts for years, and they know what they’re doing. However, times have changed. Product has changed. Most automotive lifts sold in the American market today are made in China. Some of these are wired differently than others. Some lifts are self-bleeding; some need to be manually bled. Some lifts use ATF; some do not. This is where the Installation and Operation instructions come in handy. Why calibrate a brand new wheel balancer that doesn’t need it, or ruin the hydraulics of a brand new lift (and thereby voiding your warranty); rather than simply reading the instructions? If you do know of a way that Eagle Equipment could improve their instructions, please let us know. P.S. : Please post in the comments if you know what the title to this blog post says in English! Posted on July 1, 2013 January 10, 2019 Categories Eagle EquipmentTags Automotive Equipment, Automotive Lift, calibrate, customer service, Eagle Equipment, Eagle instructions, hydraulics, ikea, Installation, manual, Operation manual, swedish meatballs, Tire Changer, Wheel Balancer, wheel equipmentLeave a comment on Do instructions ever seem like another language? Sometimes they are! Eagle Equipment attends automotive shows because they offer us an opportunity to do business face to face with our customers instead of over the phone or through e-mail. Our team enjoys discussing car lifts, motorcycle lifts, tire changers, wheel balancers, and other automotive repair equipment. Eagle has been in the automotive equipment business for almost 40 years and would love to share our product expertise with you. Please be sure visit the Eagle Equipment booth to learn about our special show pricing. Eagle Equipment has 2 post car lifts, 4 post car lifts, heavy duty auto lifts, and storage/service auto lifts IN STOCK in our North Carolina warehouse. These car lifts are ready to be shipped to you and will arrive at your auto body repair shop in just a few days. Steel and freight prices are increasing in the very near future and, as such, we, along with our competitors, will be forced to increase prices. We want you to get the best deal for your money. 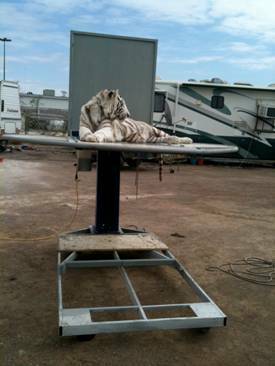 Buy our “In Stock and Ready to Ship” automotive lifts today! There are many uses for Eagle Equipment’s Tractor Lift. Let us know what you think about this photo! Thanks to one of our happy customers for sharing this! 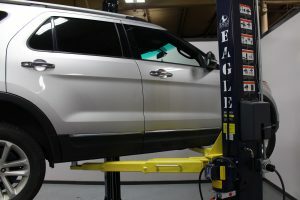 Eagle Equipment features well-engineered, long-lasting car lifts, wheel balancers, tire changers, and other automotive related products built to the highest standards. When you order from Eagle, you can be assured of the most competitive prices, quality equipment, and unsurpassed service in the industry. We respond quickly to new demands and we always welcome any type of input from our product users. At Eagle Equipment our business is based on fulfilling the needs of our customers. Our customers work hands-on in the world of automotive repair and they are some of the most creative and knowledgeable people in their fields. Everyday they experience new materials, processes, and challenges. If you are in need of a special product or have any suggestions, please contact our sales or customer service staff. Eagle Equipment greatly appreciates your input and we look forward to exceeding your expectations. Eagle Equipment’s products are designed to be shipped via common carrier freight lines and we recommend that customers pick up their products at a freight terminal. Having a product shipped to a business address or freight terminal is also less expensive than shipping to a residential address because of carrier restrictions on residential delivery. Freight companies have terminals located throughout the USA and our sales team will help find the one closest to you. Eagle does everything possible to ensure the timely arrival of your automotive shop equipment. Customer service will call you after your order has shipped with an estimate as to when you should receive your equipment, but we cannot guarantee it will be delivered on this date. After a product leaves the warehouse, the delivery process becomes the responsibility of the freight carrier. Once the product arrives at the freight terminal, the dispatcher will contact you to arrange a pick up time. Any and all products should be picked up within 48 hours of this notice. One of the benefits of receiving freight at a terminal is having their staff to load the product onto your trailer or truck. When freight is received at a business or residential address it is always the customer’s responsibility to unload the product from the back of the truck. Sometimes two people can unload the equipment by themselves. However, lift gates, forklifts, roll back trucks, or similar equipment will often be needed in order to complete this task. Lift gates can be used for unloading products such as tire equipment and motorcycle lifts. Larger equipment such as two post and four post car lifts require a forklift to offload from the truck. Lifts will also require a trailer to be transported to their final destination. For convenience, we will allow customers to pick up their equipment from our warehouse within the following guidelines. All orders picked up will be subject to applicable North Carolina sales tax unless buyer has provided a NC Sales Tax Exemption Certificate. Customers are not allowed in the warehouse area without a salesperson. Customers may not assist or interfere with the loading of the equipment. Customer is responsible for any damages to the equipment and/or their vehicle resulting from the loading and transporting of the equipment. Vehicle weight restrictions will be strictly observed. Customers may be asked to provide weight restriction information on trailers. Eagle recommends side loading of lifts onto vehicles. When this is not possible, the equipment will be rear loaded. Eagle will make its best effort to center the load weight. However, customers will be responsible for any shifting or falling of equipment or off-centered load that results in damage. Equipment will only be loaded right side up. Customers are responsible for strapping down their equipment on the vehicle. No load will be allowed to leave the premises without being strapped down. Pick up vehicles must have sufficient width and length to insure that the equipment does not protrude illegally from the vehicle. Trucks with tailgates must be able to fully close the tailgate with the equipment inside. Lifts will not be loaded onto pick-up trucks. Equipment will not be loaded onto vehicles that appear to be unsafe or lack proper equipment. This will be determined at the sole discretion of the Eagle warehouse supervisor. These requirements have been established to help insure the safety of you, your vehicle, and your equipment. If your vehicle does not meet the above requirements, we suggest that you let our logistics department obtain the best shipping quote possible for your equipment. Please call Eagle Equipment at 1-800-336-2776 for more information on receiving freight. At Eagle Equipment, ensuring our customers’ safety is our primary concern. Your car lift was designed and built with safety in mind. However, safety relies on proper installation and training. Prepare for a successful installation by making sure your floor meets specific requirements. We would like to emphasize the following floor requirements for installing 2-Post and 4 post car lifts. requires a 220v, 30amp, single phase, grounded electrical source. There should be room enough to operate the lift in a safe manner and without restrictions. • Overhead Area: The area where the lift will be located should be free of overhead obstructions such as heaters, building supports, electrical lines, doors, lights, etc. • Floor Area: Visually inspect the site where the lift is to be installed and check for cracked or defective concrete. • A level floor is suggested for proper installation and level lifting. Small differences in floor slopes may be compensated for by proper shimming. If a floor is of questionable slope, consider a survey of the site and/or the possibility of pouring a new level concrete slab. • New concrete must be adequately cured for at least 30 days. DO NOT install auto lift on any asphalt surface or any surface other than concrete. DO NOT install auto lift on expansion seams or on cracked or defective concrete. DO NOT install auto lift on a second/elevated floor without first consulting building architect. DO NOT install auto lift outdoors unless special consideration has been made to protect the power unit from inclement weather conditions. All models MUST be installed on 3,000 PSI reinforced concrete only. Additional concrete requirements will vary by lift. Specifications of concrete must be adhered to. Failure to do so could cause auto lift failure resulting in personal injury or death. All of our automobile lifts include a manual with floor and concrete specifications . Adhering to these specifications will ensure a safe and successful installation. Please visit the Eagle Equipment site for more information and online product manuals. The old saying, “There is no such thing as a free lunch”, supports the concept that you cannot get “something for nothing.” Many online businesses advertise “free freight” so consumers will believe they are getting a great deal. Merchants are actually just hiding shipping and freight charges by marking up the price of the product. Shipping and freight providers expect to be paid for their services which include palletizing, packing, loading, transporting, documentation, insurance, and unloading. These services can account for up to 50% of a product’s cost and it is you, the consumer, who pays for this whether it is added separately or included in the product price. Eagle Equipment chooses to itemize these charges to be upfront with our customers. We will do everything we can to offer the best freight pricing without lowering our standards. Our shipping department makes every effort to ship your car lift or tire equipment in a manner that allows for easy offloading, which includes arranging a carrier and extending the discounts provided to us by our shipping partners. When possible, a flatbed is used to transport larger automotive repair equipment. We also take pride in offering “great customer service” which includes accessibility, product knowledge, support, and innovation. So, when you are shopping for a car lift, wheel balancer, tire changer, or auto repair tools and equipment, make sure you do your research. Free freight may seem like a bargain at first, but in the end products with free freight may not provide the value anticipated by consumers. Copyright © 2019 Eagle Equipment. | Ecommerce Shopping Cart Software by Miva, Inc.